The coup began after midnight, so unsurprisingly, the emperor was at his residence, which was by then inside a bunker. After the palace was destroyed in May that year, the imperial family moved into a fortified shelter known as the Gobunko full time. Presumably he was in his bed there when the conspirators seized the palace grounds. With the signatures after 9pm, I thought everything [i.e. the surrender] was confirmed. However, the Army believed that the decision isn't given effect unless it was broadcast [i.e. the Jewel Voice Broadcast, and decided to interfere with the broadcast . . . The Imperial Household Ministry's phone lines were cut, and soldiers surrounded the area of the Gobunko. However, the windows had been covered with iron plates to protect against air strikes, so the soldiers were not able to determine where I was. Also, [in the movie Japan's Longest Day] machine guns were aimed in the direction of His Majesty in the Gobunko. This is also incorrect. Imperial Guards would never do such a thing. In any case, General Tanaka Shizuichi arrived around dawn and persuaded the rebels to stand down. So the emperor never confronted the soldiers face to face. Incidentally, the Emperor continued to live in the bunker until 1961. 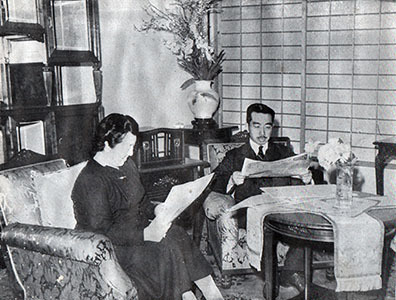 The Shōwa Emperor and the Kōjun Empress at the bunker, some time after the war. Also the emperor was not the primary target of the coup. The primary target was the surrender speech which the Emperor had recorded earlier and which were to be played on the radio to announce the already agreed upon surrender to the Japanese people. The conspirators believed if they could stop the recorded broadcast they would win supporters to their cause and ultimately for his own good, gain control of the emperor without directly confronting him which would have been political suicide. Soldiers claiming to have a higher understanding of the Emperor's beliefs was not uncommon among Japans solders refusing the orders of their superiors. Such a soldier directly confronting or threatening the Emperor would have been very uncommon. Anyway not a very well thought out coup. Not the answer you're looking for? Browse other questions tagged world-war-two japan or ask your own question. Where was the Japanese surrender signed on Okinawa in June 1945? When did Emperor Hirohito gave an address about suicides and non-productive jobs? Did Perry's Black Ships attack Edo harbour during his expedition to Japan? Why would staff officers carry swords during combat, in World War II? Did Jiang Baili receive a sword from Emperor Meiji for graduating first of his class? During WW2, how fortified was Cyprus? What did General McAuliffe actually say at Bastogne?